Sweets and Diwali are compliment to each other. Delectable sweets caramelizes relationships on the special Diwali eve. Ranging from chocolates, cookies, kaju katli, mixed sweets, soan papdi, soan cake, gulab jamun, rasgulla, and besan laddoo to coconut laddoo there is so much to explore in the range of delectable sweets online. No Diwali celebration is complete without the sweetness of these delectable sugary surprises. Make this much waited event of the year special for those who are close to your heart. 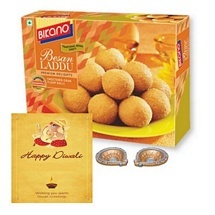 This Diwali add extra sweetness to your relationship by sending mouthwatering sweets. Present a complete Diwali hamper to express your heartiest wishes with a beautiful and heart touching quotation of ‘Happy Diwali’. No matter those who reside near to your heart live far away from you. You can still make out the best of the day with them. Annual carnival of Diwali is the high time to spend golden moments with those who made our life really beautiful. With the start of the fest on Dhanteras till the day of Bhaiya Dooj, each and every day is filled with so many rituals plus there are lots and lots of sweets to enjoy and celebrate the moment. Enhance your Diwali celebrations this year with the essence of toothsome sweets. Send attractive Diwali sweet hamper to your family, friends and all those who hold an immense position in your heart. Send amazing Diwali hampers anywhere in India online through one of the most trusted online shopping portals in India Elite Handicrafts. It’s our constant endeavor that happiness should be delivered in time, because our satisfaction lies on your smile. Get the most genuine rates of sweets and sweet hampers online only at here. We assure you with speedy and free shipping all over India, so that you can send Diwali sweets hampers online with an open heart. Diwali is the biggest and brightest festival of India and also is the biggest gifts exchange season of the year. 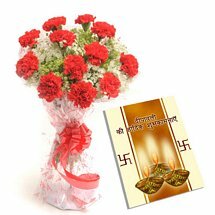 People visit their relatives and friends’ homes for greetings and conveying best wishes and also exchange gifts and sweets. 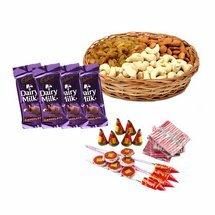 If you are unable to visit your loved one’s home and want to convey your best wishes then the best way is to send sweets hampers to India online. No matter how far you live from your relatives of family it is our responsibility to make delivery of your gift at the recipient’s doorstep without any delay. Sweets are the inevitable part of special and auspicious festivals in India so considering that we have brought you delicious and mouthwatering sweets hampers. Here you will get delectable sweets from renowned brands like Haldiram’s and Bikanervala. So, there is no worry about the quality and taste of the sweets. The sweets will be delivered fresh to your relatives no matter where they live in India. We will make online sweets delivery in all over India in almost no time. And you can also avail our one day or same day sweets delivery services in all over India. Sweets are the integral part of any Indian festival, without them a celebration is just incomplete especially biggest and brightest festival like Diwali. And sharing sugary delights with loved ones on special occasions and festivals is considered as good omen. So, this Diwali share love, care and happiness with your loved ones to celebrate the festival by sharing delectable sweets with them. We offer you delicious varieties of sweets to choose from that you can send to your relatives and friends as Diwali gifts to India. Buy and send sweets hampers to India online and make the festival extra special and as fun as it could be if you would be there. Why to stick at one hampers when you can shop for more. Yes we have wide collections of Diwali gifts that will accomplish your desires. 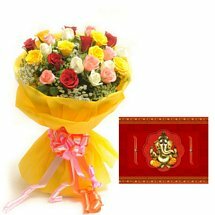 You can buy Diwali gifts online from us where you will get infinite varieties to choose from like Laxmi Ganesha idols, showpieces, idols, personalized gifts, chocolate hampers, dryfruits hampers, kitchenware, home decors, Diwali decorations, apparels, spiritual gifts, premium gifts, corporate gifts, silver gifts, gold gifts and much more. You can also delight your dear ones with delectable chocolate hampers or dryfruit hampers. These are comprises of chocolates like Cadbury celebration, Dairy milk silk, Gems, Kitkat, Ferrero Rocher and much more. And assorted dryfruits packs have pistachios, raisins, almonds, cashew nuts, walnuts etc. So, choose the best one to surprise your dear ones on this Diwali and make the day extra special for them. Diwali is the festival of lights and it is the tradition to embellish our homes with decorative items and illuminate with diyas and candles. So, considering this we have brought you mesmerizing collections of Diwali decorations that are apt for gifting purpose. We have vast collections of Diwali decorations like Bandarwal, Torans, Latkans, Wall Hangings, Artificial Flowers, Floating Flowers, Floating candles, Designer Diyas, Aromatic Candles, Rangoli Stickers, Diwali Stickers, Jhumar and much more. You can buy and send Diwali decorations online as Diwali gifts to India through our portal along with delicious sweets hampers to make it special gift for your loved ones. 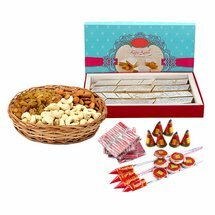 Buy the best Diwali gift for your beloved on this Diwali and teem with delectable sweets hampers to give a wonderful pack of surprise gift to make the day even more special for them.